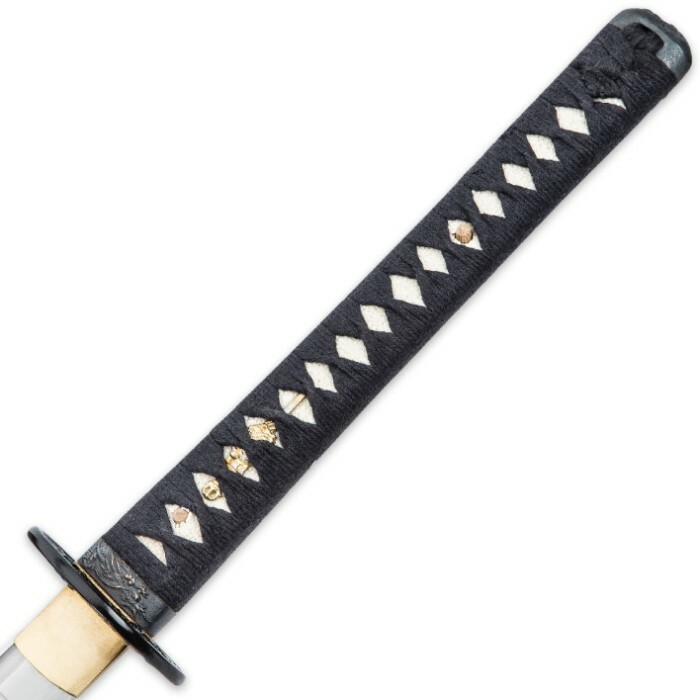 1060 Carbon Steel Hand Forged Musashi Katana Sword | BUDK.com - Knives & Swords At The Lowest Prices! 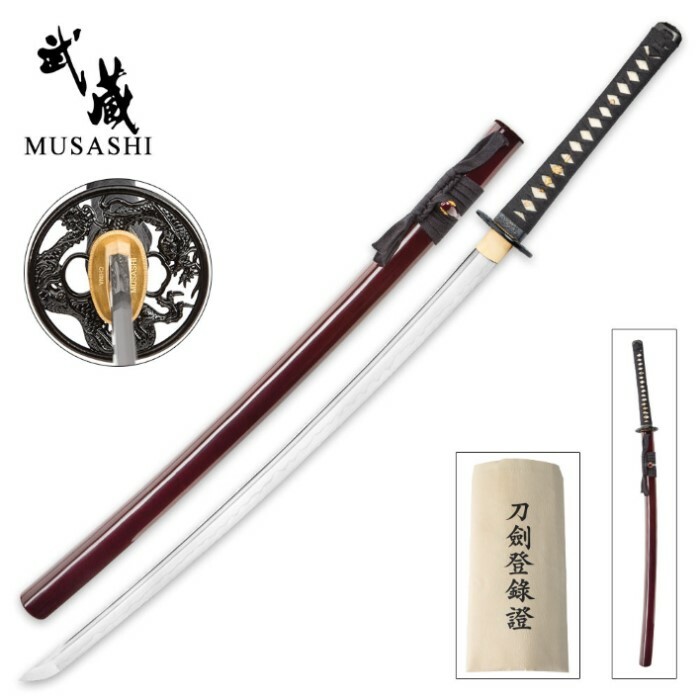 This affordably priced Musashi katana sword features a hand-forged 1060 high carbon steel blade with a traditional fuller groove and hand-sharpened edge. Traditional elements abound, including an attractive habaki, tsuba, menuki and kashira. The handle is encased in genuine ray skin with heavy cord wrappings. A hand-painted scabbard houses the 27-1/2" blade. First time buyer. Was very.. very pleased. Very good quality, sharp right out of the box. Well made, not loose at all. Will be purchasing more styles in the future. Worth more than $125 that is for sure! This is my second Musashi from the 1060 line, and overall, it's a great sword. When I first opened it, I was a little worried because the bamboo pegs were not slotted in very well, they stuck out on one side of the handle quite far. However, I was able to use a small brass hammer to tap the pegs into place, where they now site very will and even on both sides. It looks and feels much better! Once I had fixed that, the blade was fantastic. I cleaned up the shipping oil and polished it, and it's a gorgeous steel. The hamon line is very pronounced and it looks great. I haven't done any cutting with it yet, but it seems to be very sharp. The fittings, cord wrap, and blade are tight and feel very solid. As for the saya, the color is a very nice, deep red that catches the eye. The only problem I have with the sword is that, while the sword grips snugly into the saya and won't fall out, there is a little blade wobble in the lower half, so you can hear the sword rattle in the saya ever so slightly. My other Musashi doesn't do that. However, I don't believe it's enough to damage the blade at all, and therefore decided that this small flaw didn't outweigh the rest of the sword. Like I said, overall a fantastic sword. The peg issue was easily fixed, and the only problem was a bit of blade wobble: that I actually can reduce by swapping sayas on my two Musashi swords. The other sword doesn't wobble nearly as much, and this blade fits snug into the other's saya. Easy fix! All in all, 4/5 stars for the blade wobble, but I would still recommend any sword in the 1060 line to someone looking to get a few starter blades. As I said when texting my review for the shinwa fiery inferno damascus, I got these swords yesterday and not to discredit the shinwa, but the musashi is easily the baddest and best tool I've ever had the privilege of owning. It is also the lightest,sturdy,flexible and durable tool I've owned. When wielded right and practiced swings are done it sings such beautiful notes. Most other swords have to be swung much harder and faster to achieve this. Very much worth the money and I would definitely recommend this to any body who's serious about bushido or the art of the sword. For beginners I'd suggest a boken or cheaper made sword due to the fact that you will eventually destroy it. Lol. Thanks for the beautiful swords True Swords. Great thinking on getting and keeping these in stock. Keep up the good work. Gorgeous sword, feels amazing I'm my hands and is weighted great. For under $100 this blade is AMAZING! Came super sharp and nicely oiled, letter of authenticity and all the details of the sword on it. Follows samuri custome by having a name. Mine is named "Shirakawa" and the Saba was a very dark red(burgundy). Couldn't be happier with this sword. There is no room for disappointment when buying musashi steel. Thank you true swords for yet again delivering quality! For the price you can not get a better Sword. I wish I would have known about True Swords along time ago. They were helpful and the sword showed up very quickly. As most of the reviews about this Katana go they are absolutely correct, everything is in the right place. 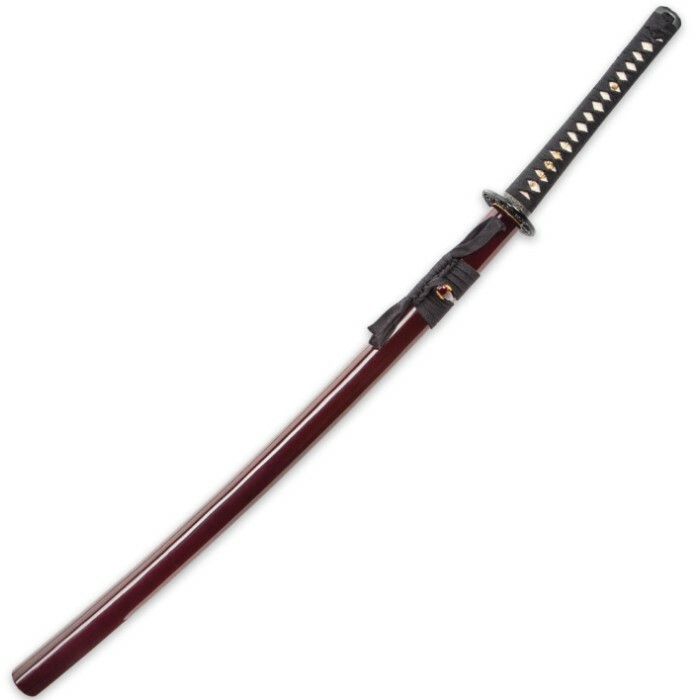 This sword is an actual Katana the only difference I can see between an actual Japanese Katana and this item is the steel. Japanese Katanas are made from sand found in Japan and this sword is made from obviously steel from somewhere else... Out of the large number of swords I own I am extreamly satisfied with this one it is my favorite. I plan on getting another one next month. Very nice all over. Blade is quite sharp, though not RAZOR sharp. Don't think it'd be hard to make it razor sharp, if you really wanted to. Feels well balanced and not flimsy or shaky at all. All the wrappings and parts seem quite snug too. The blade and sheath were both in perfect condition upon arrival. There was not a scratch to be found. My only complaint is that the sword came coated in a thick oil with much dirt and grime. I wiped the blade and clean and oiled it so now it is amazing. Thank you true swords.